Dani Garcia Award | Marbella Marbella – Adelante! 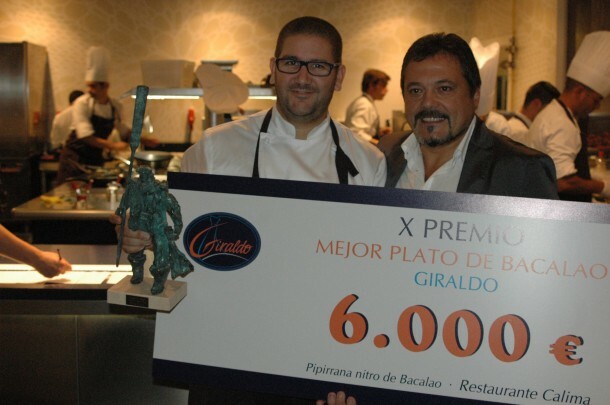 As Marbella’s 2-Michelin star Calima restaurant, in the Gran Meliá Don Pepe Hotel (but independent of the Hotel), prepares to close its doors for the winter break, Dani Garcia received yet another award to add to his burgeoning collection. Patxi Giraldo, one of Spain’s top bacalao providers, awarded his Company’s tenth annual prize to Dani for his inventive dishes made with the cured fish, worth 6,000 euros. Dani cooked a special pipirrana nitro de bacalao for the occasion. Love it or hate it, bacalao is a pillar of Spanish cuisine, and Giraldo’s fish come exclusively from the Faroe Isles where they are caught using hook and line. The celebration dinner consisted of 23 dishes and wines from many countries.